Today marks the last day on the job after 23 years for Hermiston City Manager Ed Brookshier. In 1991, grunge music dominated the charts, the Dow Jones Industrial Average closed above 3,000 for the first time, the Internet was in its infancy, Bill Clinton was still governor of Arkansas, and Ed Brookshier began his job as Hermiston city manager. Today marks the final day on the job for Brookshier. His 23-year tenure is rare for city managers (although Hermiston’s first city manager, Tom Harper, served 26 years before retiring in 1987). 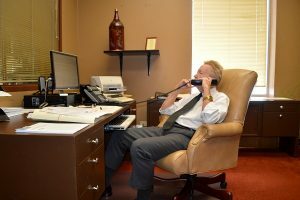 Being city manager in this day and age is a demanding, stressful job, and Brookshier is ready for a change of pace after 40 years working in city government. Brookshier doesn’t have any immediate plans for his post-retirement days. He’s agreed to serve as a consultant for Byron Smith, who takes over as city manager on Aug. 25, through the end of the year. Beyond that, he plans to take it easy for a while and enjoy himself. Brookshier talks with J.R. Cooke of the Northeast Oregon Water Association earlier this week. And although Brookshier says he is not one to look back, if he were to, he’d see a city that is virtually unrecognizable from the one he took over in 1991. Hermiston City Council President Rod Hardin, who has been on the council for more than 20 years, credits Brookshier for the growth Hermiston has experienced over the past 23 years and says his fingerprints are everywhere you look in town. “His greatest accomplishments would be the creation of our public electric utility which has saved our users thousands of dollars, establishing a parks department to improve the city’s livability, to make economic development a high priority, attracting Wal-Mart (Distribution Center), expansion of Union Pacific Railroad shops, and Pioneer Seed, and his conservative budgeting practices to assure that the city has good financial health no matter what limitations the state may put on us,” said Hardin. Former City Councilor George Anderson also has a long list of accomplishments for which Brookshier can take credit. Jackie Myers has been on the council since 1994. She said Brookshier has always had his door open to her and the other councilors. Brookshier began is public service career as a grant writer in McAlester, Okla., home of former U.S. Speaker of the House Carl Albert. It was an easy job, said Brookshier, since Albert was very good at bringing home federal dollars to his home state. His first city administrator job came in Rolla, Mo., in the late 1970s. “It was two and a half years of learning on the job the hard way,” he said. “The best thing I can say is I didn’t do anything bad and left everything standing.” He then spent three and a half years as city manager of Claremont, N.H. He then served as city administrator for O’Fallon, a suburb of St. Louis. Like Hermiston, O’Fallon had a population of about 10,000 when Brookshier arrived, and more than 17,000 when he left to come to Hermiston. Brookshier has focused much of his efforts as Hermiston city manager in growing the city’s economy and improving its quality of life. Colleagues say Hermiston’s growth over the years is due to Brookshier’s unique abilities to see into the future and identify needs that may not be apparent to everyone. Hermiston Public Library Director Marie Baldo calls Brookshier “a practical visionary.” She was the Umatilla Chemical Depot commander when she first met Brookshier. One of the things Brookshier decided Hermiston could do was start its own utility company when Pacific Power closed its Hermiston customer service office back in the late 1990s. Brookshier took a lot of heat from segments of the community when he proposed the creation of Hermiston Energy Services. Anderson said people still complain about the city condemning Pacific Power, even though they are paying, on average, about 20 to 33 percent less in utility bills. “That was a huge thing the city took on, and Ed led the charge on that,” said Umatilla Chamber of Commerce Executive Director Karen Hutchinson-Talaski, a former reporter for the Hermiston Herald. She said Brookshier was always helpful when he could be. Port of Umatilla General Manager Kim Puzey said his admiration for Brookshier grew over the years. “His commitment to greater educational opportunities, inclusive community values, well-maintained infrastructure, cost-effective utilities, targeted economic development, and thoughtful regional collaboration have a set a course that will provide success to the city of Hermiston and the surrounding area for many years,” he said. For 23 years, Brookshier has been a constant presence in the Hermiston Council Chambers. On Monday, Bryon Smith will fill Brookshier’s chair. Inclusive community values are something that pops up when people talk of Brookshier. He was behind the formation of the city’s Hispanic Advisory Committee, as well as the city’s support in bringing the Cinco de Mayo celebration to the downtown area. Brookshier said there is little he would change if he could go back in time, with the exception of the city’s handling of the controversy surrounding former Police Chief Dan Coulombe. When rumblings began surfacing of the department’s unhappiness with the chief, Brookshier and the council were slow to respond. 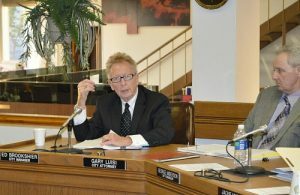 The result was an effort to recall several city councilors with the end goal being the eventual removal of Brookshier. The councilors – and Brookshier – survived the recall, but there were hard feelings that haven’t totally gone away. Brookshier said he wishes he’d been more on top of the situation. Much has changed about Hermiston in the past 23 years. Brookshier, too, has undergone some changes, as well. Some health scares in the late 1990s prompted Brookshier to make some significant changes to his lifestyle. First, there was a mild heart attack, but Brookshier said the scariest thing for him was when he was told he was a candidate for diabetes if he didn’t make some changes. He changed his eating habits, cut back on the prodigious amounts of coffee he drank, and began walking routinely at Riverfront Park. The result is a slimmed-down and more energetic Brookshier. He said he is looking forward to spending more time outdoors, writing poetry and reading. He and his family have no plans to move out of the area, even though the city’s appearance early on did not impress him. When he arrived in Hermiston in 1991 to interview for the job, his plane landed at the Tri-City Airport after dark. He was picked up by the then council president, who started apologizing for the city’s aesthetics as they came into town. “He said, ‘Sometimes Hermiston looks better after dark,’” Brookshier recalls with a laugh. Since then, however, Hermiston has cleaned up the solid waste eyesores, put more greenery and landscaping in, built fountains throughout town and added to and improved its parks. What hasn’t changed, however, is the openness of the people – something that Brookshier said helped make Hermiston home to him and his family.